Sooty mold fungi cause needles, branches, or leaves of trees or shrubs to appear black. 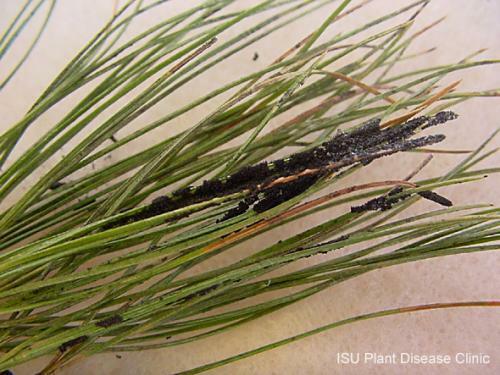 The common name "sooty mold" is descriptive of the black coating or crust that is formed on these plant surfaces. Several different species of fungi often exist together to cause the sooty appearance. These fungi don't infect plants, but grow on the sugary honeydew excreted by aphids, scales, mealybugs, and other insects. The growth of these fungi is primarily an aesthetic problem, although they can be detrimental to plant health by blocking sunlight and interfering with photosynthesis. Control of sooty mold is targeted at preventing or reducing insect populations. Scales and aphids are usually the culprits in sooty mold infestations. It's important to identify the species of insect present to determine what control measures to apply and when. In Iowa, sooty mold is most commonly spotted on pine, maple, and elm trees, but can occur in variety of plant species.